In Greece, life’s simple pleasures abound. These days our time belongs to us. We can spend it how and where we choose. And recently, we chose to spend some time island-hopping in Greece. Island-hopping by ferry can be as quick or as slow as you want. There are fast ferries to whisk you from island to island or you can enjoy the slow, leisurely pace of the regular ferries. If you’re travelling in the high summer season, be sure to book your tickets in advance. Setting off from Athens, our first port of call was the island of Mykonos, a two-hour, 15-minute journey on the fast ferry. The slow ferry takes a little over five hours. In Mykonos, we spent lazy days on the golden sands of Ornos Bay—just a three-kilometre, $3 bus ride from Mykonos Town—lying on sunbeds, gazing out over the sparkling calm waters and dipping in and out of a juicy novel. Just a few steps away were some of the best restaurants in Mykonos where we enjoyed crunchy, vibrant salads washed down with a crisp local wine before heading back to our sunbed to sleep the afternoon away. Later, after a sundowner or two, we would take our pick of restaurants and feast like kings for less than $50. How simple life can be. In Paros, our accommodation was half-way up the hill overlooking the capital, Parikia. Each morning we’d stroll the 20 minutes down the hill and along the beach to the port. There we’d drink coffee with the locals and watch them play their favourite board games. In the afternoon, a wander through the cobblestoned back streets would lead us to small restaurants where we would enjoy the local grilled fish of the day and a chilled beer. On the island of Santorini, we stayed in the village of Oia. The iconic, blue-domed church just a few steps away from our accommodation is the most photographed on the island. Accommodation with a swimming pool is expensive in Oia, so here’s a tip… Don’t worry about finding a spot with a pool. We didn’t. Instead, when we wanted to cool off, we headed for Lioyerma Lounge Cafe. It has a swimming pool, plus an extensive food, wine and cocktail menu. You can spend all day there lazing by the pool—with great WiFi—just as long as you spend €5 (around $8) on a drink or a meal, which is no great hardship. 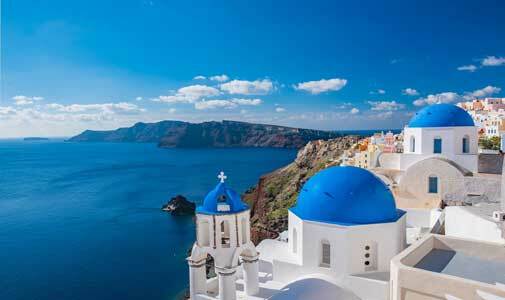 If you enjoy hiking, there’s a spectacular 10-kilometre hike from Oia to Fira (the capital). Sunrise is the best time to head out, before the heat of the day kicks in. Take plenty of water and don’t be surprised if some of the local dogs accompany you on the walk. They’ll even lead you down the right path if you take a wrong turn. Life just does not get any better than this.